The first world map to show any significant portion of the Antarctic Coast. Chart of the World Shewing the tracks of the U.S. Exploring Expedition in 1838, 39, 40, 41 & 42. The United States equivalent to the voyages of James Cook, Jean François Galaup de Lapérouse, Alejandro Malaspina, and Ivan Fedorovich Kruzenshtern for England, France, Spain, and Russia, and the maritime equivalent of Lewis and Clark. Despite being largely unrecognized in its day, mostly due to Wilkes' own abrasive personality, but also because of political maneuvering in Washington, the U.S. Ex. Ex. was among the longest and most successful voyages of discovery ever undertaken. This map is of exceptional importance to Antarctica collectors, being the first World map to depict any significant portion of the Antarctic coast and one of two maps used by Wilkes to definitively prove Antarctica's continental nature. Among the many great achievements of the U.S. exploring expedition, and Wilkes specifically, the surveying of the Antarctic coast now known as Wilkes Land, stands out as the most significant. The chart covers that portions of Antarctica now known as Wilkes Land, located due south of New Zealand and Australia (ghosted in at the top of this chart), roughly from Cape Hordern (100°31' e) to Point Alden (142°02' e). Five profile charts in the upper left quadrant offer views of the Antarctic shoreline. This map was prepared by Charles Wilkes and engraved by Sherman & Smith. 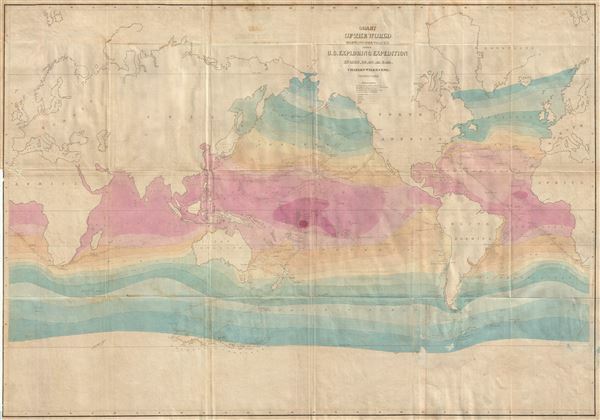 Despite being dated 1842, and copyrighted in 1844, it was first published by Lea & Blanchard of Philadelphia to illustrate the atlas volume of the 1845 first edition of Wilkes's official U. S. ex. ex. report.